I’ve been searching for God for most of my life in one way, in one form or another. I write about women’s spirituality, lead transformational retreats for women, and am an art therapist. I’ve literally made God my business. I’m always on the lookout for opportunities to grow “The Magic,” the immanent, intimate, purposeful expression of the Divine within my own heart and the heart of the world. I was raised in a religion that did it’s best to convince me God was a distant patriarch who expected total obedience to His laws. “The Magic” is a fluid presence. She – for She is indeed a feminine presence – is tender, playful and encouraging as well as whip smart and unwavering; an unseen yet steady guide and companion I came to know in my twelfth year. Given my upbringing, I was nothing short of astonished to discover in my twenties that “The Magic,” my Magic, was the Universal Mother, the feminine face of God. Until that moment, I had no idea God could be a woman. From that point on, I read everything I could about Her. I prayed. I meditated. I listened for Her, to Her, in the small moments and epic events of my life, in others, in the teachings of all religions. I had no doubt She would show up. (She is, after all, Omnipresent!) All I had to do is improve my ability to recognize Her. Over the years, one of the many books I turn to for inspiration is the Bhagavad Gita, a time-honored classic of spiritual literature that is an evocative blueprint for living the spiritual life. The Gita tells the story of Arjuna, an embattled Indian prince, his efforts to rise above the ferment that prods the soul to reign in its native purity and nobility. Though Arjuna’s ishta (the Sanskrit word for “cherished Divinity”) is different than mine, his questions and doubts mirror the travails of my spiritual journey. I take comfort in the Gita’s mystical verse. To help readers understand the undreamed-of possibilities that lie within us – the breadth and depth and dominion of our soul – Vyasa, the Gita’s author, describes the limitless nature of the soul in a profusion of poetic metaphors. This elegant array of our divine potential appeals to me both as a writer and as a seeker. Feminist pioneer Riane Eisler; Academy Award-winning actress Olympia Dukakis; social justice activists Sister Helen Prejean, Zainab Salbi, and Le Ly Hayslip; spiritual leaders Sri Daya Mata, Reverend Lauren Artress, Rabbi Laura Geller, and Grandmother Twyla Hurd Nitsch; leadership doyenne Margaret J. Wheatley; dancer Katherine Dunham; Gestalt therapist Miriam Polester; Fullbright scholar Alma Flor Ada; and Mother-of-the-Year Gail Williamson. I clearly saw that – individually and en masse – these soulful women embody what Vyasa may well have referred to as “manliness.” Their manliness, however, not only transcends gender identification, it transcends the specificities of path, age, ethnicity, race, and profession – the external demarcations of “me and mine” that separate us from each other and separate us from the unity of our soul.Their manliness appears not just in them, but also in “everyday” women: the women I meet in the retreats I lead and in my colleagues and friends; in women everywhere. Just as “manliness” is not limited to gender, it is not dependent on a public presence. 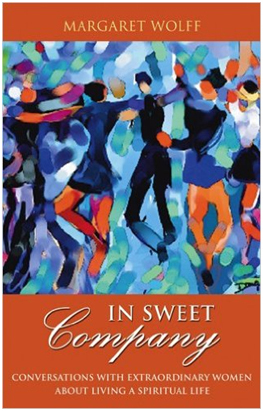 The women of In Sweet Company honor their feelings and acknowledge their humanity. They understand that their limitations and vulnerabilities are stepping-stones to spiritual transformation, that they are greater than the sum of their flaws and their mistakes: They are a work in progress. The women of In Sweet Company are rip-roaring bold. They push the edge of the envelope. They search out, speak up and stand in their truth even when that truth is hard to face. But they do not impose their truth on others. They establish boundaries for themselves that insure their well-being. That said I no longer take issue with Vyasa’s words. It’s not what I call the genderless soul that matters to me, it’s that I call on my soul, that I use my life to lift what veils my soul’s strength and beauty so I can, like Arjuna, come to reign in its native purity and nobility. This is why I write and teach. To learn more about Margaret’s work, please visit her website, In Sweet Company.